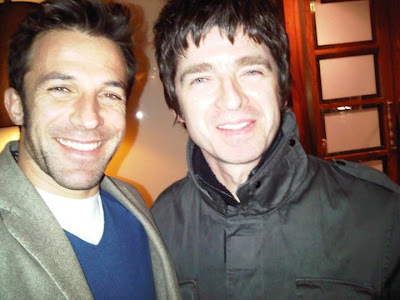 TURIN - Noel with Del Piero tonight in the (boring) city where the famous Michael Caine movie The Italian Job was filmed. I think the last time was more than 30 years ago, at the end of the 1970s, and they came to Milan, a 2-2 in Uefa Cup (City were in the last part of their best period), and City qualified, having won 3-0 @ Maine Road. But Milan won the league that year. Tonight Roberto Mancini completed his Italian Job with a 1-1 and City topping Group A. Both teams played with some reserves, as Juventus were already out and City already qualified but needed at least a draw to be first. One of the South American strikers, Jo scored: now the boss will be hoping for a similarly happy ending when he meets up with another one... He said Tevez is playing on Monday. City bright start fizzled out and Juve gradually got a hold on the game before taking the lead just before the break. Del Piero produced a bit of magic, Noel was watching him :). There were also 2 clear penalties for City, not given (all the rivals of Juve would say: typical :). City played well and deserved to draw, extending their unbeaten run to 9 matches. Today Friday the draw for Europa League and Champions League, at 12:00am in Switzerland. Risk of great matches, with Barcelona, Real Madrid, Chelsea, Manchester United, etc. in one side, and AC Milan, Inter, etc. in the other (but now there can't be Real-Milan again). Now Milan will be stronger with Cassano, so the worried ones should be all the other teams. We don't fear anyone, we are Milan. In Europa League, against City there could be Italian Napoli, or good teams from the Champions League as Rangers, Benfica, etc.